‘Kids and adults alike will be taken on a journey’ promises Cathy Petocz, the star of Pea. This inventive interpretation of Hans Christian Andersen’s classic fairy tale The Princess and the Pea is premiering at the Street Theatre, Canberra this month. I had a chat to Petocz to find out all about the show, from the energetic puppets to the mystical Museum of Legendary Vegetables. 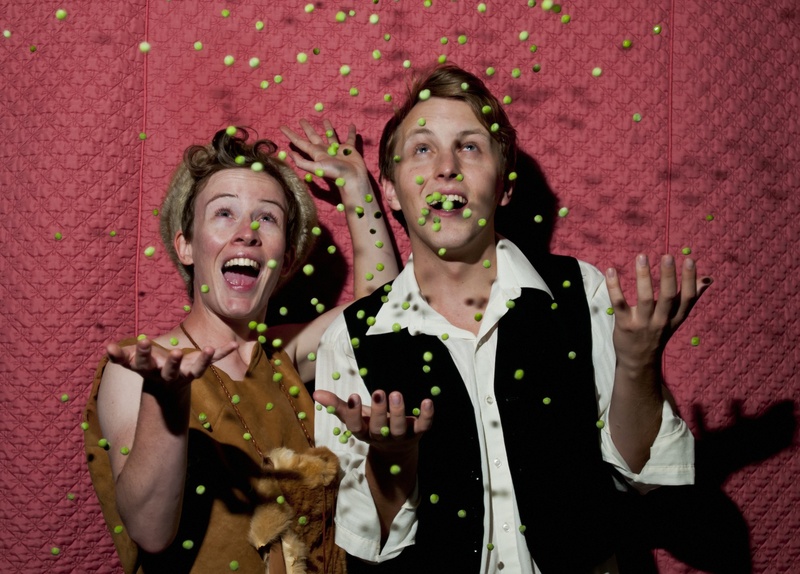 Produced in partnership with the serious theatre and the St Theatre, Pea is an intelligent show for children aged 4-10. That said, the cleverly-crafted script by David Finnigan is sure to entertain audiences of all ages. Directed and dramatized by Barb Barnett, this production brings together 2-D and 3-D puppetry with physical theatre. This innovative approach offers a new perspective on a much-loved story that explores the true meaning of friendship and courage, and learning to accept people for who – not what – they are. ‘Pea is about friendship’ Petocz explained, ‘about discovering that you can have a true friendship with people you wouldn’t have expected’. The two adults in the play, feisty Princess Gwendolyn (Petocz), fresh from the Wild Western Wood, and the bookish, lonely Prince Gregor (Josh Wiseman), who lives in a lonely castle, form an unlikely bond. Together they embark on many adventures in the Museum of Legendary Vegetables, where the play is set. The real star of the play is, however, Pea, the pint-sized narrator who joins Princess Gwendolyn and Prince Gregor on their brave adventure. Puppets are used to portray the non-human characters, including Pea. In what is ‘quite an energetic show’, Petocz and Wiseman operate and voice all of the puppets. While this presents a number of technical challenges, Pecotz finds it ‘easier to maintain the energy of the production’, as she is active the whole time. She went on to discuss the ways in which the combination of puppetry with live action brings to life the real beauty of theatre. It is clear that she relishes the opportunity to participate in productions aimed for children, having worked previously worked in children’s theatre. It seems the entire team behind Pea are passionate about bringing intelligent theatre to the young and young at heart. Barnett worked closely with Finnigan to tease out the themes and ideas explored in the script, with her attention to detail something admired by Petocz. The ‘rich textual analysis’ enabled the actress great insight into the themes of the play. These include gender stereotypes, with Princess Gwendolyn and Prince Gregor each possessing characteristics that contrast with traditional gender roles. Playful, energetic and engaging, Pea promises to be a fun theatre experience that will capture the hearts and minds of kids big and small. If you want to be taken on a magical journey, then be sure not to miss this production! This entry was posted in Art, Arts, Featured, Theatre and tagged canberra, children, fairytale, kids, puppets, theatre. Bookmark the permalink.